Pathways: Inspiring Future Scientists Through a New Collaboration with Scholastic, Inc.
I’m pleased to announce the debut of Pathways , a collaboration between NIGMS and Scholastic, Inc., that provides a collection of free educational resources about basic biomedical science and research careers. UPDATE: For additional information, see the Notice of Availability of Administrative Supplements for Equipment Purchases for NIGMS Awardees, NOT-GM-18-022. Applications are due May 31. NIGMS is offering administrative supplements of between $50,000 and $250,000 for the well-justified purchase of single pieces of equipment. In past years, we issued separate funding announcements (PA-15-089 and PA-16-125) for this purpose. This year, however, we will accept requests for equipment supplements from Principal Investigators (PIs) who hold NIGMS R01, R35, R37, or R15 awards under PA-18-591, Administrative Supplements to Existing NIH Grants and Cooperative Agreements (Parent Admin Supp Clinical Trial Optional). Eligible investigators are strongly encouraged to discuss potential requests with their program directors before submitting applications. Two or more NIGMS grantees at the same institution may submit separate but cross-referenced requests, where the funds requested reflect the actual proportion of the time that the shared equipment would be used by each PI. However, under no circumstances may a joint request exceed $400,000 in direct costs. The requested supplemental budget cannot exceed the total year direct cost amount of the parent award. PIs may not request future year funds. NIGMS strongly encourages investigators to seek matching funds from their institutions or elsewhere, and to ensure that follow-up expenses (such as maintenance contracts) will be covered from other available funds. Institutional contributions and commitment will be factored into funding decisions. It’s crucial that the results of NIH-supported biomedical research are reproducible, unbiased, and properly validated. Establishment and use of rigorous and reproducible approaches require appropriate and sustained training of researchers and students. In 2014, we announced a funding opportunity to develop, pilot, and disseminate training modules to enhance data reproducibility. The products of these grants are posted on the NIGMS website as they become available, together with other relevant training modules about conducting rigorous and reproducible research. We’ve just reissued a funding opportunity announcement (FOA) to support the development of additional training modules in three areas that build upon and extend those targeted through the previous FOA. The three new areas of emphasis are: 1) How scientific culture, organization, and incentives influence the rigor and reproducibility of biomedical research; 2) Good laboratory practices and record keeping; 3) Advanced experimental design and analysis. UPDATE: Enrollment for the course is open until October 15. The path to a successful career as a biomedical scientist is rarely direct: There can be stops along the way, and each person has different motivations, opportunities, and challenges. The path also depends, in part, on the institution, program, or department where the student is training, and finding the right scientist, mentor, or coach to help guide that journey isn’t the same for everyone. 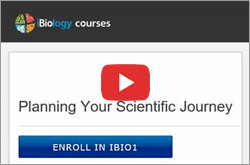 A new online training program supported through an Innovative Programs to Enhance Research Training (IPERT) grant to iBiology can help participants navigate this process. The free 6-week course will take place October 2 to November 13. The course can accommodate nearly 20,000 participants. New course content will be released on a weekly basis to allow students time to focus on each week’s lessons. The course is expected to be offered again in either the spring or fall of 2018. Ultimately, iBiology plans to make this course available in a self-paced format—further enhancing students’ ability to benefit from the course offering, and to revisit the course content at any time. iBiology is just one of the awardees in our IPERT program. IPERT R25 grants support creative and innovative research educational activities that are designed to complement and/or enhance the training of a workforce to meet the nation’s biomedical research needs. Each IPERT grant must also address the NIGMS goal of creating a highly skilled and diverse biomedical workforce, and integrate three required elements: short courses/workshops for skill development, mentoring, and outreach. To learn more, visit the IPERT webpage. The next receipt date for applications is January 23, 2018. If you develop or use software for structure-based drug design or generate data on drug target structures and ligand affinities, you may be interested in the Drug Design Data Resource (D3R) . This is an NIGMS-funded project to collect and share high-quality protein-ligand data sets, develop computer-aided drug design workflows, and engage the community through blind prediction challenges. The D3R, hosted by the University of California, San Diego, continues a program initiated by NIGMS under the Community Structure-Activity Resource (CSAR) at the University of Michigan. A goal of this program has been to gather previously unpublished data from the pharmaceutical industry and other sources and to make it available for validating and improving software for predicting ligand poses and interaction energies. Several data sets have already been donated by companies, including Genentech, AbbVie, GlaxoSmithKline, and Vertex, as well as by academic groups. Both resources have also generated data sets internally or in collaboration with academia. The data sets, which contain X-ray crystal structures of protein-ligand complexes and structure/activity data for multiple series of ligands, represent 13 different drug targets, including most recently for HSP90, MAP4K4, and designed steroid and vitamin D binding proteins. D3R has also collected data on host-guest systems and made this data available as part of the SAMPL series of challenges for benchmarking software predictions of “simple” small-molecule chemical properties such as solvation free energy, partition coefficients, and binding to hydrophobic cavities. Building on the success of its 1st Annual D3R Workshop , in which the 2015 Grand Challenge was discussed and summarized in a report, D3R just announced the 2016 Grand Challenge . It is based on structures of the Farnesoid X receptor (FXR) and runs through February 2, 2017. The resource also has developed a Continuous Evaluation of Ligand Pose Prediction (CELPP) series of tests in collaboration with the World Wide Protein Databank (wwPDB) and the Research Collaboratory for Structural Bioinformatics (RCSB), another resource supported by NIGMS. The CELPP tests, which are distinct from the Grand Challenge, will provide chemical compound identifiers of bound small molecules in addition to the protein polymer sequence five days before release of 3D coordinates, giving developers an opportunity to predict docked poses each week. D3R and its predecessor CSAR were developed to meet the needs of the drug design community identified during workshops several years ago. Continued community input and participation, including additional data donations, are important to help D3R fulfill its mission. Data releases can be coordinated with publication in other formats and venues. Contact D3R principal investigators Rommie Amaro and/or Michael Gilson or send email to drugdesigndata@gmail.com to see how you can be involved.